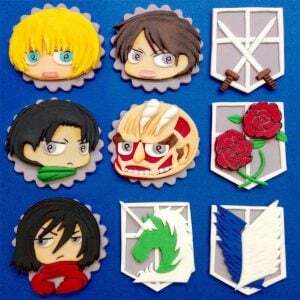 Make your next batch of freshly baked cupcakes an absolute hit with Attack on Titan fans! These chibi cupcake decorations come in a set of 12, 100% edible fondants that friends and family can sink their teeth into. Sometimes eating your favorite Japanese dish can be tricky if you can’t use chopsticks! Luckily Rilakkuma is here to help make Japanese cuisine night even more fun by utilizing the lazy bear as a handy guide for your chopsticks. What seems like a crazy idea at first is actually an awesome way to enjoy copious amounts of popcorn while watching anime. This unique popcorn bucket is shaped like the Eva Unit’s head, comes with light-up eyes and even opens its mouth! Need a little extra speed the next time you play drinking games? Have Sonic join you for your next round of shots with this officially licensed Sonic the Hedgehog shot glass. Show your buddies who finishes their shots first! Mix up some cookie dough and combine your secret recipe with these One Piece inspired cookie cutters! These 3D printed cutters make baking even more fun, while providing smiles and full bellies for friends and One Piece fans alike. Say goodbye to lunches in brown-bags and disposable plastic containers! Enjoy a gourmet meal served in an eco-friendly bento lunchbox that includes two stackable containers, plastic cutlery and a secure strap for easy transportation. Spending your day running mazes, eating pellets and chasing ghosts can bring anyone’s energy level down. Luckily these bubbly beverages are full of fruity flavors and enough caffeine to send those troublesome ghosts running! Enjoy the morning coffee routine even more as you wrap your hands around this novelty Starbucks and Gurren Lagann crossover mug. This custom made ceramic mug replaces the traditional Starbucks logo with your favorite gun-slinging girl, Yoko! Select your weapon and increase cutting accuracy! This wooden cutting board comes skillfully sculptured into the shape of a classic Final Fantasy NES cartridge. An ideal geeky accessory for your kitchen! Reading manga sure can make a person hungry! This cookbook let’s you know what characters are eating and provides an illustrated step-by-step guide to preparing simple Japanese dishes. Includes recipes for bento boxes, main dishes and more! Add the perfect finishing touch to Japanese cuisine night with an appropriate sugary treat. This DIY candy kit is a fun alternative that replaces your traditional sushi with yummy fruity flavors and enough sugar to drive your dentist mad. Here’s your chance to buy the world’s strongest plate! One Punch Man fans can now eat every one of their meals from this hilarious plate featuring the superhero’s lifeless expression. You can lick Saitama’s face clean! Pay homage to the living, moving mechanical bombs from Super Mario with this hand painted ceramic Bob-omb mug. He will hold almost anything for you, including your favorite beverage or food. Hopefully before he blows up! This set of four drinking glasses let you know how much power you have left! Hearts fill up when cold beverages are added, and when your drink gets warm or empty, they’ll start to fade. That’s when you know it’s time to refresh your drink!